Trips to the groomer can be expensive and time consuming. 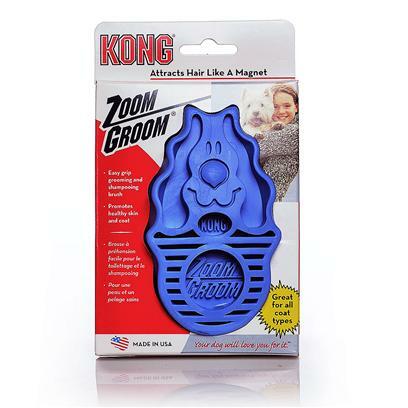 The Zoom Groom makes it easy to clean your dog's coat and promote healthy skin. The one-piece, flexible rubber design attracts unwanted hair, dead skin, and dander while delivering a gentle massage. The Zoom Groom works well dry and even better when you're giving your dog a bath. You'll get your dog's hair clean down to the skin and enjoy less shedding and a happier dog. Use gentle strokes on your dog any time. Zoom Groom works especially well during a bath. use the Zoom Groom to massage the shampoo into your dog's coat and skin. For more information, visit kongcompany.com.